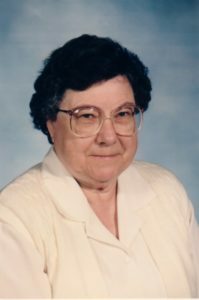 Dominican Sister of Peace Jean (Mary Mark) Kinney, OP, 89, died on December 19, 2018, at the Mohun Health Care Center of the Dominican Sisters of Peace in Columbus, OH. Sister Jean was born in Ironton, OH, in 1929, to Norma Elberfeld and Francis Kinney. She entered religious life in 1957, serving on the staff of Elkins Park in Philadelphia, PA.
Sr. Jean received her CCD certification from Siena College in Albany, New York, in 1962. She went on to earn a Bachelor of Science in Economics and Business Education from St. Rose College in Albany, a Master’s Certificate in Religious Education and a Master of Arts in Religious Studies from LaSalle College in Philadelphia, PA, and continuing professional education credits from Central Islip Psychiatric Center. Sr. Jean shared her love of God and the Church through her pastoral ministries in Pennsylvania, New York and New Jersey. She served as the Coordinator of Religious Education, as a Pastoral Associate, a Pastoral Counselor, Spiritual Director at the Dominican Pastoral Counseling Center in Scotia, New York and on the Retreat Staff at the Dominican Sisters Retreat Center in Niskayuna, New York. In her remembrance at Sr. Jean’s funeral, Sr. Carol Gaeke reminded us that Sr. Jean was a trailblazer – she was one of the first in the Congregation to make a Cursillo, to adopt new catechetical methods, to go into pastoral care, getting her certificate in CPE. But more important, she was also able to be intimate – to work one on one with those in pain to effect healing of the soul. Through hospital chaplaincy, hospice work, counseling, and spiritual direction, she helped people to see God’s love for them and to live life with peace and joy, or in her hospice work, help them to go home to God in peace. Sr. Jean was preceded in death by her parents and her siblings, Fr. Francis Kinney, CPPS and her sisters Henrietta Hanifin and Marsha Morgan. She is survived by nieces and nephews. A Vigil of Remembrance and Wake for Sister Jean Kinney was held on Wednesday, January 2, 2019 at the Dominican Sisters of Peace Motherhouse Chapel, Columbus, OH. The funeral liturgy was held at the Dominican Sisters of Peace Motherhouse Chapel on Thursday, January 3, 2019. Sr. Jean Kinney will be interred at the St. Agnes Cemetery, Menands, NY. Memorial gifts in Sr. Jean’s memory may be sent to the Dominican Sisters of Peace, Office of Mission Advancement, 2320 Airport Dr., Columbus, OH 43219 or submitted securely at oppeace.org. 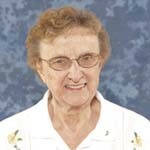 Dominican Sister of Peace Joanne Baltz (89) died at Regina Care Center in Akron, OH on December 18, 2018. Born August 25, 1929, Sr. Joanne was the daughter of Margaret Thimmes and Albert Baltz of Lancaster, OH. She felt called by God from a very early age but worked as a bookkeeper for a short while before entering religious life 1948. 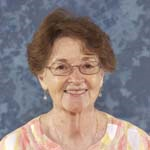 Sr. Joanne began her ministry as a primary school teacher in Illinois, Ohio, and Pennsylvania. She earned a Bachelor of Arts in Elementary Education from Ohio Dominican University in 1958, taking classes at the same time that she was teaching primary school in Ohio. She earned her Master of Arts in Elementary Education from the University of Notre Dame in 1966, as well as additional courses in administration, supervision and child psychology at Xavier and the University of Dayton. She truly loved working with little children and did her best to be as prepared as possible to give her students a quality academic and moral grounding. 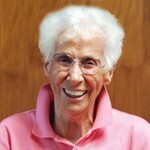 Sr. Joanne served as a principal for 23 years at St. Francis, Newark, OH, and St. Mary in Lancaster, OH. After leaving teaching, Sr. Joanne served as the Administrator of the Columbus, OH, Motherhouse and the Fleet Manager for the Community. Her organizational and administrative skills were a true asset in these important roles! She spent several years caring for her own family members before she moved to the Mohun Health Care Center, where she served as a volunteer as well as in prayer and presence. She was particularly helpful to our Activities Director, helping to set up and offer assistance to other Sisters. Sr. Joanne was preceded in death by her parents, Margaret Thimmes and Thomas Baltz, her brothers Albert and John, and her sisters Mary and Dorothy. She is survived by her nieces and nephews. Sr. Joanne was remembered at a December 19 wake and December 20 Funeral Mass at the Chapel in the Columbus Motherhouse of the Dominican Sisters of Peace. She was interred at St. Joseph’s Cemetery in Columbus, OH. 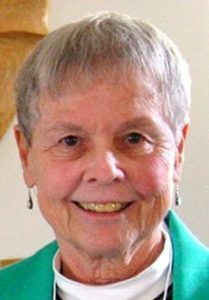 Memorial gifts in Sr. Joanne Baltz’s memory may be submitted securely online at oppeace.org or sent to the Dominican Sisters of Peace, Office of Mission Advancement, 2320 Airport Drive, Columbus, OH 43219. Dominican Sister of Peace Rosemarie (Margery Ann) Robinson, 89, died on December 1, 2018, at the Regina Health Care Center of the Dominican Sisters of Peace in Akron, OH. Described as “gracious, kindly, diligent, wise, competent, capable, good-humored, generous, ingenious, and outstanding,” Sr. Rosemarie celebrated 70 years of religious life this year. Born in Youngstown, OH, in 1929, Sr. Rosemarie was one of nine children born to Anne Helbig and George Robinson. She entered religious life in 1946, following the example of her sister, Sr. Bernadine, who is also a Dominican Sister of Peace. Sister Rosemarie earned her Bachelor of Science in Education in 1958 and her Master of Science in Education in 1966 from St. John College of Cleveland. True to the Dominican charism, she also continued her studies with courses at Ball State, Kent State, Siena Heights and the University of Dayton. Sr. Rosemarie took her love of learning and study to her early ministry, serving as a teacher and educational administrator at schools in Akron, Barberton, Cleveland and Doylestown, OH. Beyond teaching her elementary and middle school students, she also served as a mentor and guide for the teachers on her staffs. She was an active and important support to her founding congregation, the Dominican Sisters of Akron. She was elected Second Councilor in 1969, and served as President from 1973 to 1981. She was thrilled to preside over the burning of the million-dollar mortgage in 1976. Her educational experience was put to good use as she served as business manager, personnel director and maintenance coordinator at Our Lady of the Elms, and on various committees as well. As first Co-delegate for Religious and later Delegate for the Diocese of Cleveland, Sr. Rosemarie used her gifts of leadership and foresight to enhance the lives and spirit of the religious in the diocese. In her final years, she served the people of God and her Sisters in a ministry of prayer and presence at our Akron Motherhouse and at the Regina Care Center. Sr. Rosemarie is survived by three sisters, Anita Watson, Coletta and Sister Bernadine Robinson, OP. She was preceded in death by her parents, Anne and George, her brothers, George and Richard, and three sisters, Eileen Macupa, Kathleen and Rosemary. A Memorial Mass was be held at Our Lady of the Elms Convent Chapel in Akron, OH, on Thursday, December 6. Sr. Rosemarie was interred at Holy Cross Cemetery in Akron, OH. 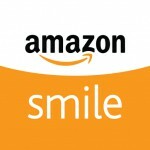 Memorial gifts in Sr. Rosemarie Robinson’s memory may be submitted securely online at www.oppeace.org or sent to the Dominican Sisters of Peace, Office of Mission Advancement, 2320 Airport Drive, Columbus, OH 43219.